The Franco-Indian alliance was an alliance between American Indians and the French, centered on the Great Lakes and the Illinois country during the French and Indian War. The alliance involved French settlers on the one side, and the Abenaki, Menominee, Mississauga, Sioux, Huron-Petun, Potawatomi etc. on the other. It allowed the French and the Indians to form a haven in the valley before the open conflict between the European powers erupted. France had a presence in Northern America, starting with the establishment of New France in 1534. Acculturation and conversion were promoted, especially through the activities of the Jesuit missions in North America, but unlike the other colonial powers, under the guidance of Louis XIII and Cardinal Richelieu, encouraged a peaceful coexistence in New France between Natives and Colonists. 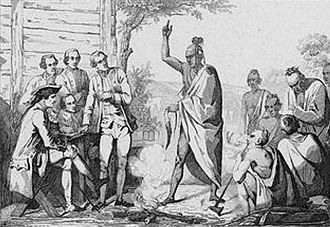 The Baron de Saint-Castin was adopted by an Abenaki tribe and married a native girl, governor Frontenac danced and sang war songs at an Indian council. While Daniel Liénard de Beaujeu fought bare-chested and covered with war paints at the battle against Braddock, Natives adopted French habits, like chief Kondiaronk who wanted to be buried in his uniform of captain or Kateri Tekakwitha who became a Catholic Saint. French settlers and natives were allied in every conflict preceding the Seven Years War, Father Rales War, King Georges War, intermarriages were frequent in New France, giving rise to the Métis people. In North America in the 18th century, the British outnumbered the French 20 to 1, britain had a string of successes, especially with the Battle of Fort Niagara, and the Franco-Indian alliance started to unravel. At the same time, the British were making promises of support, finally Quebec fell in September following the Battle of the Plains of Abraham. At the conclusion of the Seven Years War in 1763, New France was divided with Canada going to the British, long after the extinction of New France in 1763, Franco-Indian communities would persist, practicing the catholic faith, speaking French and using French names. From the Saint Lawrence to the Mississippi, cosmopolitan French communities accommodated Indians, in 1869 and 1885, Louis Riel led two Métis revolts against the Canadian government, known as the Red River Rebellion and the North-West Rebellion. The Franco-American alliance was the 1778 alliance between the Kingdom of France and the United States during the American Revolutionary War. Formalized in the 1778 Treaty of Alliance, it was a pact in which the French provided many supplies for the Americans. 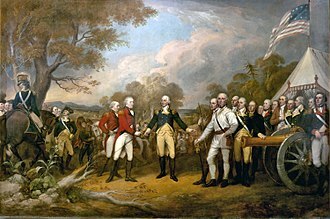 The Netherlands and Spain joined as allies of France, Britain had no European allies, the French alliance was possible once the Americans captured a British invasion army at Saratoga in October 1777, demonstrating the viability of the American cause. The alliance became controversial after 1793 when Britain and Revolutionary France again went to war, relations between France and the United States worsened as the latter became closer to Britain in the Jay Treaty of 1795, leading to an undeclared Quasi War. The alliance was defunct by 1794 and formally ended in 1800, France had been left deeply alarmed by the British success in the Seven Years War which they feared gave the British naval superiority. From 1763 both France, and their allies Spain, began to rebuild their navies and prepare for a war in which they would construct an alliance to overwhelm. As Britains troubles with its American colonies intensified during the 1760s and eventually led to rebellion in 1775. In September 1775 the Continental Congress described foreign assistance as undoubtedly attainable and began to seek supplies, the French leadership sought the humiliation of England and began giving covert aid to the rebels. 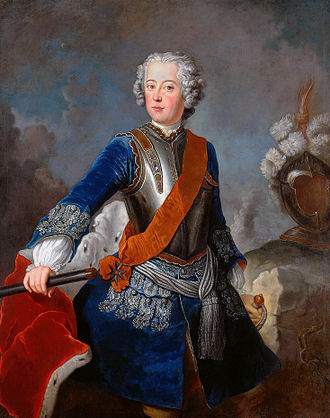 The American Declaration of Independence was advocated by some as necessary in order to secure European support against Britain, Silas Deane, an American envoy in Paris, proposed a major anti-British alliance and French invasions of Hanover and Portugal which were both British allies. The alliance was promoted in the United States by Thomas Jefferson, based on the Model Treaty of 1776, Jefferson encouraged the role of France as an economic and military partner to the United States, in order to weaken British influence. In 1776, Latouche Tréville transferred ammunition from France to the United States of America, numerous French supplies as well as guns of the de Valliere type were used in the American War of Independence, especially the smaller 4-pounder field guns. Romanticism in Scotland was an artistic and intellectual movement that developed between the late eighteenth and the early nineteenth centuries. Scott had a impact on the development of a national Scottish drama. Art was heavily influenced by Ossian and a new view of the Highlands as the location of a wild, Scott profoundly affected architecture through his re-building of Abbotsford House in the early nineteenth century, which set off the boom in the Scots Baronial revival. Intellectually and figures like Thomas Carlyle played a part in the development of historiography, Romanticism influenced science, particularly the life sciences, geology and astronomy, giving Scotland a prominence in these areas that continued into the late nineteenth century. Scottish philosophy was dominated by Scottish Common Sense Realism, which shared some characteristics with Romanticism and was an influence on the development of Transcendentalism. Scott played a part in defining Scottish and British politics, helping to create a romanticised view of Scotland. Romanticism began to subside as a movement in the 1830s, and it had a lasting impact on the nature of Scottish identity and outside perceptions of Scotland. It is associated with political revolutions, beginning with those in Americana and France and movements for independence, particularly in Poland and Greece. It is often thought to incorporate an emotional assertion of the self and of individual experience along with a sense of the infinite, transcendental, in art there was a stress on imagination, landscape and a spiritual correspondence with nature. It has been described by Margaret Drabble as a revolt against classical form, conservative morality, authoritarian government, personal insincerity. Allan Ramsay laid the foundations of a reawakening of interest in older Scottish literature, as well as leading the trend for pastoral poetry, James Macpherson was the first Scottish poet to gain an international reputation. Claiming to have found poetry written by the ancient bard Ossian, he published translations that acquired international popularity and it was popularised in France by figures that included Napoleon. The Renaissance in Scotland was a cultural and artistic movement in Scotland, from the late fifteenth century to the beginning of the seventeenth century. It involved an attempt to revive the principles of the era, including humanism, a spirit of scholarly enquiry, scepticism. The court was central to the patronage and dissemination of Renaissance works and it was central to the staging of lavish display that portrayed the political and religious role of the monarchy. The Renaissance led to the adoption of ideas of imperial monarchy, the growing emphasis on education in the Middle Ages became part of a humanist and Protestant programme to extend and reform learning. It resulted in the expansion of the system and the foundation of six university colleges by the end of the sixteenth century. 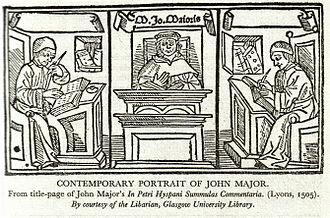 Vernacular works in Scots began to emerge in the fifteenth century, with the patronage of James V and James VI, writers included William Stewart, John Bellenden, David Lyndsay, William Fowler and Alexander Montgomerie. 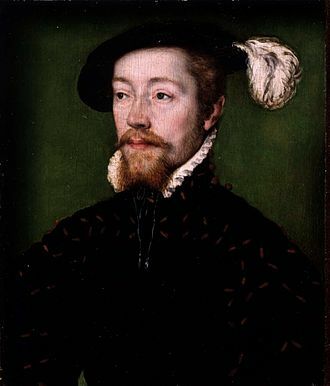 In the sixteenth century, Scottish kings, particularly James V, built palaces in a Renaissance style, the trend soon spread to members of the aristocracy. Painting was strongly influenced by Flemish art, with works commissioned from the continent, music incorporated wider European influences although the Reformation caused a move from complex polyphonic church music to the simpler singing of metrical psalms. Combined with the Union of Crowns in 1603, the Reformation removed the church, in the early seventeenth century the major elements of the Renaissance began to give way to Stoicism and the Baroque. It encompassed a rational and sceptical attitude, a return to ideas of original sources and proportion, the major ideas of the Renaissance are generally considered to have reached Northern Europe much later, in the late fifteenth century. Instead they emphasised the intellectual trends and movements that went before it. It was common for historians to suggest that Scotland had little or no participation in the Renaissance. The alliance was exceptional, and caused a scandal in the Christian world. Carl Jacob Burckhardt called it the sacrilegious union of the lily, the Habsburg Empire thus entered in direct conflict with the Ottomans. Some early contacts seem to have taken place between the Ottomans and the French, Louis XI refused to see the envoys, but a large amount of money and Christian relics were offered by the envoy so that Djem could remain in custody in France. Djem was transferred to the custody of Pope Innocent VIII in 1489, France had already been looking for allies in Central Europe. 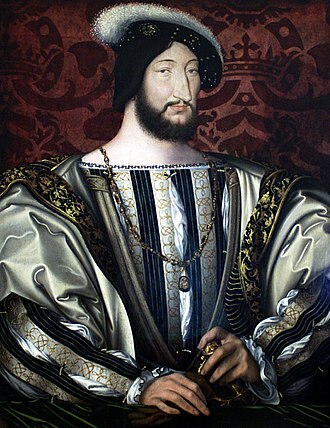 The ambassador of France Antonio Rincon was employed by Francis I on several missions to Poland, at that time, following the 1522 Battle of Bicoque, Francis I was attempting to ally with king Sigismund I the Old of Poland. Finally, in 1524, a Franco-Polish alliance was signed between Francis I and the king of Poland Sigismund I and this situation forced Francis I to find an ally against the powerful Habsburg Emperor, in the person of Suleiman the Magnificent. The alliance was an opportunity for both rulers to fight against the rule of the Habsburg, the objective for Francis I was clearly to find an ally in the struggle against the House of Habsburg, although this policy of alliance was in reversal of that of his predecessors. 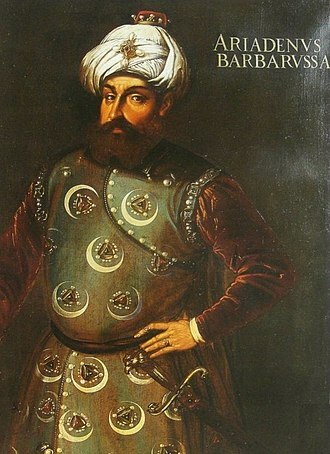 The pretext used by Francis I to seal an alliance with a Muslim power was the protection of the Christians in Ottoman lands, King Francis was imprisoned in Madrid when the first efforts at establishing an alliance were made. 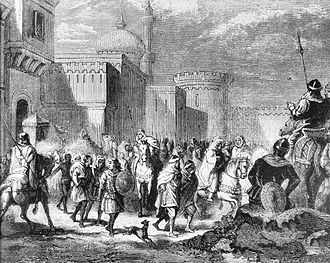 A first French mission to Suleiman seems to have been sent right after the Battle of Pavia by the mother of Francis I, Louise de Savoie, but the mission was lost on its way in Bosnia. The Ottomans were attracted by the prestige of being in alliance with such a country as France. Meanwhile, Charles V was manoeuvring to form a Habsburg-Persian alliance with Persia, envoys were sent to Shah Tahmasp I in 1525, and again in 1529, pleading for an attack on the Ottoman Empire. In 1528 also, Francis used the pretext of the protection of Christians in the Ottoman Empire to again enter into contact with Suleiman, in his 1528 letter to Francis I Suleiman politely refused, but guaranteed the protection of Christians in his states. A Franco-Persian alliance or Franco-Iranian alliance was formed for a short period between the French Empire of Napoleon I and Fath Ali Shah against Russia and Great Britain between 1807 and 1809. The alliance was part of a plan to gather extra aid against Russia and by Persias help, having another front on Russias southern borders, the alliance unravelled when France finally allied with Russia and turned its focus to European campaigns. Due to the friendly relations of France with the Ottoman Empire formalized by a long-standing Franco-Ottoman alliance. Attempts to resume contact were made following the French revolution, as France was in conflict with Russia, in 1796, two scientists, Jean-Guillaume Bruguières and Guillaume-Antoine Olivier, were sent to Iran by the Directoire, but were unsuccessful in obtaining an agreement. Soon however, with the advent of Napoleon I, France adopted a strongly expansionist policy in the Mediterranean and the Near East. Napoleon assured the Directoire that as soon as he had conquered Egypt, he will establish relations with the Indian princes and, together with them, attack the English in their possessions. Napoleon was initially defeated by the Ottoman Empire and Britain at the Siege of Acre in 1799, and at the Battle of Abukir in 1801, by 1802, the French were completely vanquished in the Middle East. In order to reinforce the Western border of British India, the diplomat John Malcolm was sent to Iran to sign the Anglo-Persian Treaty of 1801, Napoleon sent General Horace Sebastiani as envoy extraordinary, promising to help the Ottoman Empire recover lost territories. In his grand scheme to reach India, the step for Napoleon was now to develop an alliance with the Persian Empire. Early 1805, Napoléon sent one of his officers Amédée Jaubert on a mission to Persia and he would return to France in October 1806. General Tsitsianov occupied Georgia against rival Iranian claims, and attacked Ganja in Iran in 1804, triggering a Russo-Persian War, Britain, an ally of Russia, had been temporizing without a clear show of support. The Shah decided to respond to Napoleons offers, sending a letter carried by ambassador Mirza Mohammed Reza-Qazvini to the court of Napoleon, in Tilsit in eastern Prussia. From the fifth century North Britain was divided into a series of petty kingdoms. Of these the four most important to emerge were the Picts, the Scots of Dál Riata, the Britons of Strathclyde, after the arrival of the Vikings in the late eighth century, Scandinavian rulers and colonies were established along parts of the coasts and in the islands. In the ninth century the Scots and Picts combined under the House of Alpin to form a single Kingdom of Alba, with a Pictish base and dominated by Gaelic culture. After the reign of King David I in the twelfth century, Alexander II and his son Alexander III, were able to annexe the remainder of the western seaboard, cumulating the Treaty of Perth with Norway in 1266. Scotland established its independence from England under figures including William Wallace in the thirteenth century. Kingship was the form of government, growing in sophistication in the late Middle Ages. The scale and nature of war changed, with larger armies, naval forces. Christianity introduced monasticism and what has been identified as Celtic Christianity, Scotland grew from a relatively small area in the eastern Lowlands, to approximately its modern borders. The varied and dramatic geography of the land provided a protection against invasion and it defined the largely pastoral economy, with the first burghs being created from the twelfth century. The population may have grown to a peak of a million before the arrival of the Black Death in 1337, in the early Middle Ages society was divided between a small aristocracy and larger numbers of freemen and slaves. Serfdom disappeared in the century and there was a growth of new social groups. The Pictish and Cumbric languages were replaced by Gaelic, Old English and Norse, from the eleventh century French was adopted in the court and in the late Middle Ages, derived from Old English, became dominant, with Gaelic largely confined to the Highlands. Christianity brought Latin, written culture and monasteries as centres of learning, from the twelfth century, educational opportunities widened and a growth of lay education cumulated in the Education Act 1496. 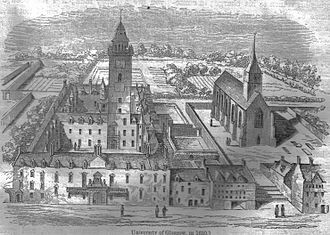 Until in the century, when Scotland gained three universities, Scots pursuing higher education had to travel to England or the continent, where some gained an international reputation. After the execution of Charles I in 1649, the Scottish Parliament declared his son Charles II to be King of Great Britain and Ireland. 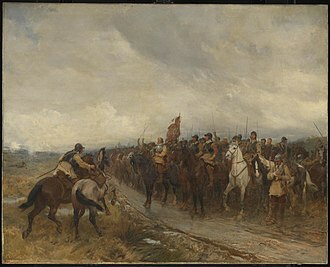 The English responded with a led by Oliver Cromwell, resulting in defeats for the Scots at Dunbar and at Worcester. Under the terms of the union, the Scots gained 30 members of parliament, but many posts were not filled, or fell to English agents of the government, and had very little say at Westminster. Initially the government was run by eight commissioners and adopted a policy of undermining the power of the nobility in favour of the meaner sort. From 1655 it was replaced by a new Council of Scotland, headed by Irish peer Lord Broghill, the regime built a series of major citadels and minor forts at immense cost. 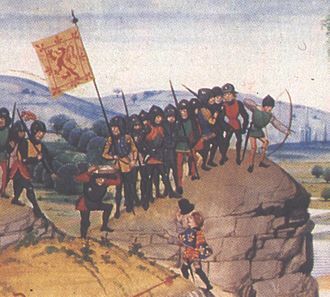 The Scottish legal system was suspended, but some courts and institutions were gradually restored, generally the regime was successful in enforcing law and order and suppressing banditry. There was a major Royalist rising in the Highlands in 1653–55 led by William Cunningham, Earl of Glencairn, after initial success, it suffered from internal divisions and petered out after defeat at the Battle of Dalnaspidal in 1654. The Commonwealth extended toleration to Protestants, including sectaries, but the significant group were a small number of Quakers. The regime tended to favour the Protestors giving them control over the universities, the country was relatively highly taxed, but gained access to English markets. The era was remembered as one of prosperity, but not everywhere benefitted from economic expansion, there was an attempt to create national symbols with the revival of the union flag and unite coin. 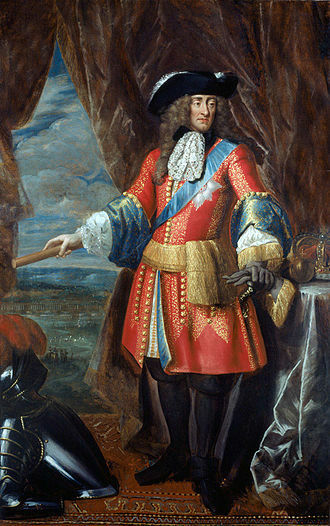 After the death of Oliver Cromwell and the fall of his son Richards regime, General Monck marched the army in Scotland south and facilitated the Restoration of Charles II in 1660. 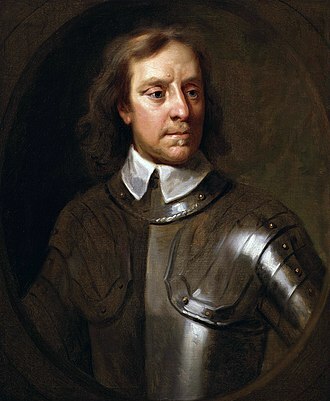 Having supported Parliament in the First English Civil War under the Solemn League and Covenant, as part of a Second English Civil War, they invaded England in support of royalist risings, and were defeated by the New Model Army under Oliver Cromwell at Battle of Preston. With many of its leaders captured, the Engagement regime fell in the Whiggamore Raid, after the execution of Charles I in January 1649, England was declared a Commonwealth. Scotland during the Roman Empire refers to the protohistorical period during which the Roman Empire interacted with the area that is now Scotland, which was known to them as Caledonia. Roman legions arrived around AD71, having conquered the Celtic tribes of Britain over the three decades. Aiming to annex all of the island of Albion, Romans under Q, Julius Agricola invaded the Caledonians in the 70s and 80s. An account by Agricolas son-in-law Tacitus mentions a Roman victory at Mons Graupius which became the namesake of the Grampians but has been questioned by modern scholarship and this line was fortified as Hadrians Wall. Several Roman commanders attempted to conquer lands north of this line. The history of the period is complex and not well-documented, the province of Valentia, for instance, may have been the lands between the two Roman walls, or the territory around and south of Hadrians Wall, or Roman Wales. Romans held most of their Caledonian territory only a little over 40 years, some Scottish historians such as Moffat go so far as to say Romes presence was entirely uninfluential. Scots and Scotland proper would not emerge as unified ideas until centuries later, the Scoti, Gaelic Irish raiders who would give Scotland its English name, had begun to settle along the west coast as well. All three groups may have involved in the Great Conspiracy that overran Roman Britain in 367. The era saw the emergence of the earliest historical accounts of the natives, the most enduring legacies of Rome, were Christianity and literacy, both of which arrived indirectly via Irish missionaries. Scotland had been inhabited for thousands of years before the Romans arrived, however, it is only during the Greco-Roman period that Scotland is recorded in writing. The work On the Cosmos by Aristotle or Pseudo-Aristotle mentions two very large islands called Albion and Ierne, the Greek explorer and geographer Pytheas visited Britain sometime between 322 and 285 BC and may have circumnavigated the mainland, which he describes as being triangular in shape. In his work On the Ocean, he refers to the most northerly point as Orcas, pomponius Mela, the Roman geographer, recorded in his De Chorographia, written around AD43, that there were 30 Orkney islands and seven Haemodae. 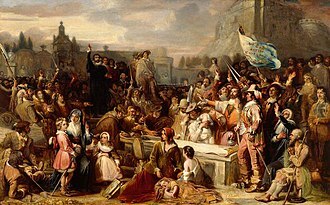 The Glorious Revolution in Scotland was part of a wider change of regime, known as the Glorious Revolution or Revolution of 1688, in the British kingdoms of the Stuart monarchy in 1688–89. After the Restoration of the monarchy in 1660 in the person of Charles II, the reintroduction of episcopacy led to divisions in the church as some Presbyterians began to attend separate conventicles. 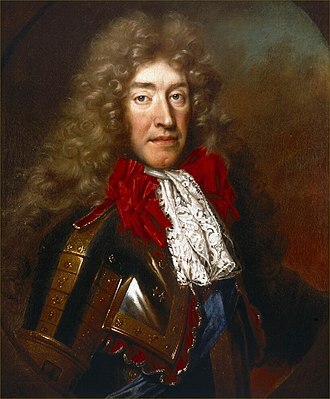 The Catholicism of Charless heir, Duke of Albany and of York, alienated some support, Scotland had little option but to accept a change of monarch and a Presbyterian-dominated convention offered the crown of Scotland to William and Mary. Episcopacy was abolished and the Whigs became dominant in politics, there were a series of Jacobite risings between 1689 and 1746 in favour of James and his heirs. 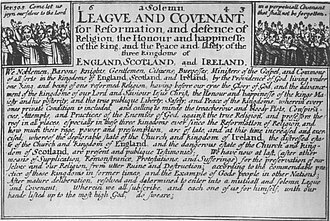 As a result of the Revolution, Scotland was drawn into major international wars, in 1638 the Scots had rebelled against the religious policies of Charles I, established a national Covenant and abolished episcopacy. During the 1650s Scotland had been defeated and for a short time annexed to the English Commonwealth. The Restoration of the monarchy in England in 1660 meant a restoration in Scotland as a fait accompli. In the event Scotland regained its system of law and kirk and they had a king in Charles II who did not visit the country and ruled largely without reference to Parliament through a series of commissioners. These began with John Middleton and ended with the brother and heir, Duke of York. Church ministers were forced to accept the restoration of episcopacy or lose their livings, up to a third, at least 270, of the ministry refused. 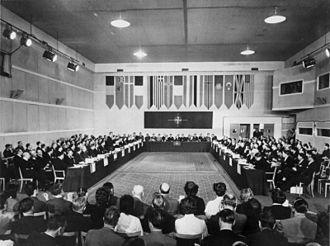 Many ministers chose voluntarily to abandon their own rather than wait to be forced out by the government. Most of the vacancies occurred in the south-west of Scotland, a particularly strong in its Covenanting sympathies. Abandoning the official church, many of the people began to attend illegal field assemblies led by excluded ministers. They became known one of their leaders as the Cameronians. 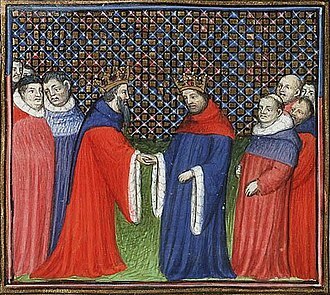 Harun al-Rashid receiving a delegation of Charlemagne in Baghdad, by Julius Köckert. Father Jacques Marquette with Indians. Montcalm trying to stop Native Americans from attacking British soldiers and civilians as they leave Fort William Henry. Jean-Baptiste Chaigneau (in mixed Franco-Vietnamese uniform) was an important actor of the first French intervention in Vietnam. Mgr Pigneau de Behaine was the main instigator of the French intervention in Vietnam from 1777 to 1824. Pigneau de Behaine and Nguyễn Ánh fled together to the island of Phu Quoc. Louis XVI gave his agreement to the 1787 Treaty of Versailles with Vietnam. Lafayette wounded at the Battle of Brandywine in September 1777. French Navy ships of the line in the Battle of the Chesapeake, 1781. 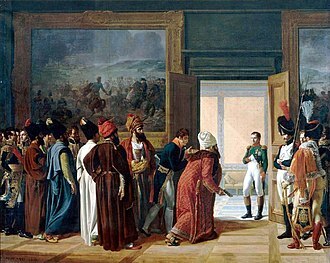 The Iranian Envoy Mirza Mohammed Reza-Qazvini meeting with Napoleon I at the Finckenstein Palace, 27 April 1807, to sign the Treaty of Finckenstein. 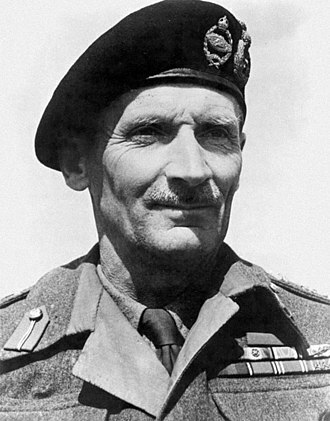 François Mulard. 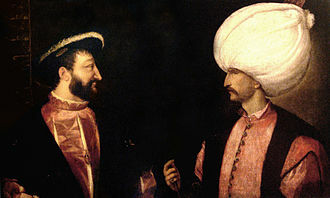 The French General Horace Sebastiani negotiated a Franco-Ottoman alliance with Selim III. Letter of Fath-Ali Shah to Napoleon I, thanking him for the letter received through M. Jaubert, and asking for military instructors, December 1806. The Treaty of Finckenstein between Persia and France, ratified 10 May 1807. A beach on Oronsay, looking towards Jura. Both islands have produced evidence of Mesolithic human settlement. Sand Bay and the Inner Sound. The rock-shelter at Sand is an important Mesolithic site. Kinloch at the head of Loch Scresort, Rùm. This area has provided two early Mesolithic sites. Coronation of King Alexander on Moot Hill, Scone, beside him are the Mormaers of Strathearn and Fife. John Knox, the key figure in the Scottish Reformation. 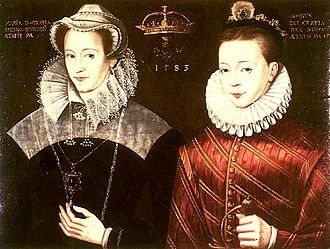 Mary Queen of Scots depicted with her son, James VI and I; in reality, Mary saw her son for the last time when he was ten months old. Adam Smith. 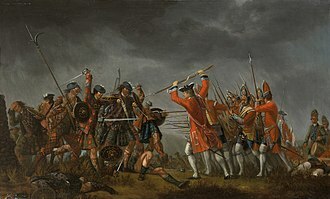 the "father of modern economics"
Modern historical thinking gives less importance to the Battle of Culloden as a factor in the demise of clanship. David Wilkie's 1829 flattering portrait of the kilted King George IV, with lighting chosen to tone down the brightness of his kilt and his knees shown bare, without the pink tights he wore at the event. 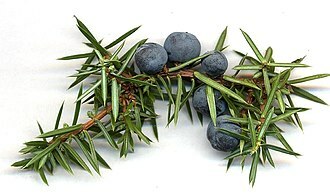 Juniper is attributed as the clan badge of clans Gunn, Macleod, Murray, Nicolson of Skye, and Ross. Carving of a 17th-century classroom with a dominie and his ten scholars from George Heriot's School, Edinburgh.